Programme for young children exploring medical conditions. Riz is happy when Dr Ranj tells him his missing tooth will soon be replaced by a grown-up one. Programme for young children exploring medical conditions. Dr Ranj helps Riz go to a party by stopping his itching skin. Programme for young children exploring medical conditions. Dr Ranj has to test the sugar in Petal's blood because she is feeling so tired. Programme for young children exploring medical conditions. Deep thinks he is turning into a giant raspberry until Dr Ranj says it's actually a food allergy. Programme for young children exploring medical conditions. Dr Ranj cheers up Kiwa when he says the itchy spots she has won't stop her from going camping. Programme for young children exploring medical conditions. Riz feels tired because he doesn't sleep for long and doesn't eat very healthy food. Programme for young children exploring medical conditions. Poor Petal keeps going to the loo and Dr Ranj has to test her wee to find out why. Programme for young children exploring medical conditions. Nurse Morag shows the Healthy Helpers how to use their lungs to play a breathing fun game with a long straw. Programme for young children exploring medical conditions. Dr Ranj explains to Kiwa how ear wax helps to protect her ears. Programme for young children exploring medical conditions. Dr Ranj makes Deep smile when he tells him that jelly and ice cream can help with a cold sore. Programme for young children exploring medical conditions. 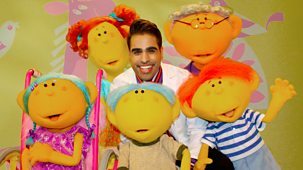 Dr Ranj soothes Petal's sore eyes and the Healthy Helpers paint pictures of their eyes for Nurse Morag. Programme for young children exploring medical conditions. Nurse Morag gets the Healthy Helpers bouncing on hoppers when they look at what helps people poo. Programme for young children exploring medical conditions. Dr Ranj puts on his pingy gloves to comb the lice from Petal's hair. Programme for young children exploring medical conditions. Kiwa is surprised when Dr Ranj tells her how snot can be helpful. Programme for young children exploring medical conditions. Dr Ranj shows Deep he does not need to worry about injections. Programme for young children exploring medical conditions. Nurse Morag has the Healthy Helpers playing ball in a pool to explore how medicine works. Programme for young children exploring medical conditions. Nurse Morag shows the Healthy Helpers how to make different sounds with their lips, tongues and teeth.